It has paid for college educations, built some churches, won some elections, and has probably won wars," Broadslab owner and Master Distiller Jeremy Norris speaks to the deep and lasting effects that moonshine, and moonshine profit has had in southern communities like Broadslab, located just four miles east of Benson. 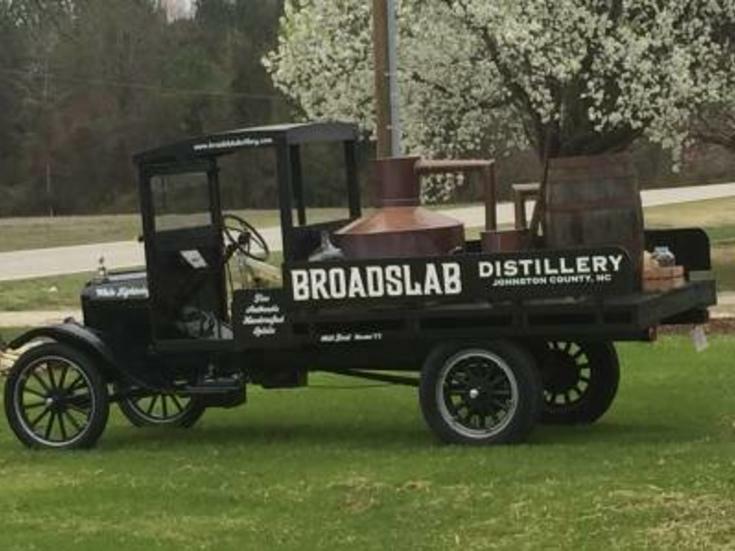 Over the course of Broadslab Distillery&apos;s three year history, including ABC store distribution, an appearance in an episode of A Chef&apos;s Life, and now the opening of an on-site tasting room, both locals and visitors far and wide have discovered its incredible story. But, just a few encounters with Jeremy and you&apos;ll come to realize that he has more stories than you have time. Each one rich with heritage, ripe with humor and the love of farm and family, flavorful and potent like the shine running out of the still. Johnston County&apos;s legacy as the "Moonshine Capital"
Jeremy would love to know if Johnston County is the Moonshine Capital of North Carolina -- he even did some research trying to document the number of "busts" and arrests in the county. He thinks it would be a great project for someone with lots of time -- he was overwhelmed with the numbers. The competition seems to be another county west of here in the foothills....name being withheld as not to start a feud. Today, there are around 23 distilleries in the state, and with legislation pending that will allow distilleries to sell on site, one bottle per visitor, per year, he expects more to open. Jeremy is what we would dub the "real deal", with a back story about growing up in a family of moonshiners in a community known for the trade. Unlike some distilleries in the state using moonshine stories as a marketing ploy, Jeremy is building a brand whose story has honest origins. How Jeremy&apos;s love for the family farm is now the heart of his business. The Broadslab recipes are the embodiment of a five generation legacy which were passed down by the great-great grandfathers on both sides of Jeremy’s family. 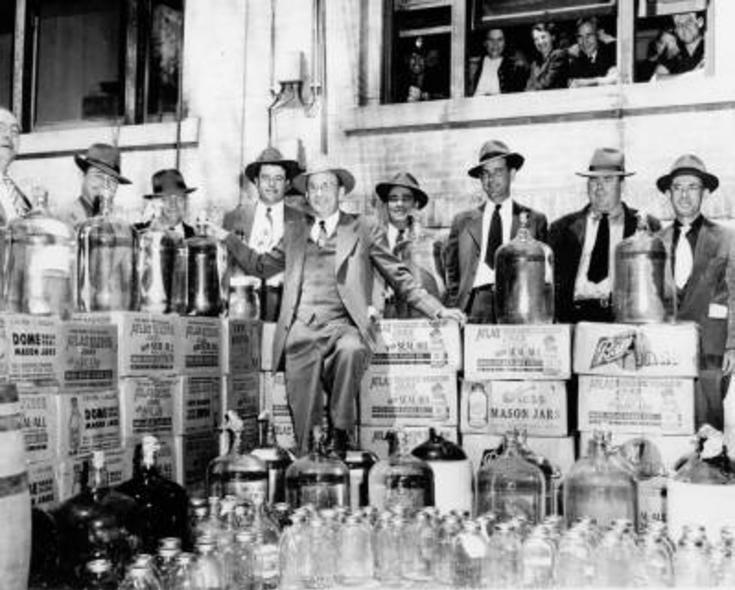 One of them, William “Bill” McLamb, was active in the dawn of the moonshine trade and distilled smooth, sipping whiskey long before prohibition. But it was Jeremy’s grandfather, Leonard A. Wood, who eventually passed on the family recipe. Jeremy was raised by his grandfather, who operated a produce stand there at the house, which is now the tasting room. Once moonshine became legal in NC, Jeremy saw the opportunity for his family to turn a lawless legacy into a labor of love operation. His grandfather Leonard finally agreed to share his knowledge, recipes, and oral shine history. If Jeremy could make an honest business of shining, Leonard didn&apos;t see anything wrong with that. And so they toiled together, perfecting the process and arguing between decades of tradition and modern techniques. As Jeremy’s mentor and personal consultant, Leonard was integral in building the Broadslab still, but passed away before the opening. Since then, Jeremy has purchased land from his family to own the farm his grandfather loved so much. Jeremy has roots in the land like many other Johnston County farmers. The distillery sits in the footprint of many of his stills on the family farm outside Benson, NC. Broadslab&apos;s story is both personal and endearing -- and it&apos;s a story visitors will hear when getting the tour and enjoying the tastings. We could sit and listen to Jeremy for hours! About the products -- get a taste! As far as Jeremy knows, he is the only distillery in the state that is growing the grain, harvesting and processing it, and making it all with natural ingredients. If you&apos;re standing in the Broadslab tasting room, you&apos;re standing on the land that the corn in your whiskey was grown on. There will be no additives, artificial ingredients, or syrups in Broadslab products. Some are even considered organic for those foodies that seek out that designation. But, there are some other important "organic" ingredients to Broadslab Distillery&apos;s product that make it truly one of a kind. The hand-crafted love that goes into every step in the process is one ingredient. From "dirt to bottle", Jeremy is the engine behind the process putting that drink in your hand. Jeremy&apos;s grandfather told him there are two kinds of shine, the shine you sell and the shine you drink. Jeremy is making the shine you drink. He has altered the methods his grandfather used to pour off the harsh chemicals that are in front of the "drinking shine", and he cuts off the still before the bitter taste at the bottom affects the product. This "sweet spot" so to speak is the fine product Jeremy is producing. Jeremy has remarked more than once that his grandfather would get upset that Jeremy was "wasting" a portion of the product in order to craft a better taste. While Jeremy understood the practicality behind his grandfather&apos;s idea, he wanted his product to be as smooth as possible. Jeremy put the word "shine" on his bottles and not moonshine -- he finds people won&apos;t give the product a chance. Once they try it, they remark, "that&apos;s a well-rounded spirit, not a moonshine." 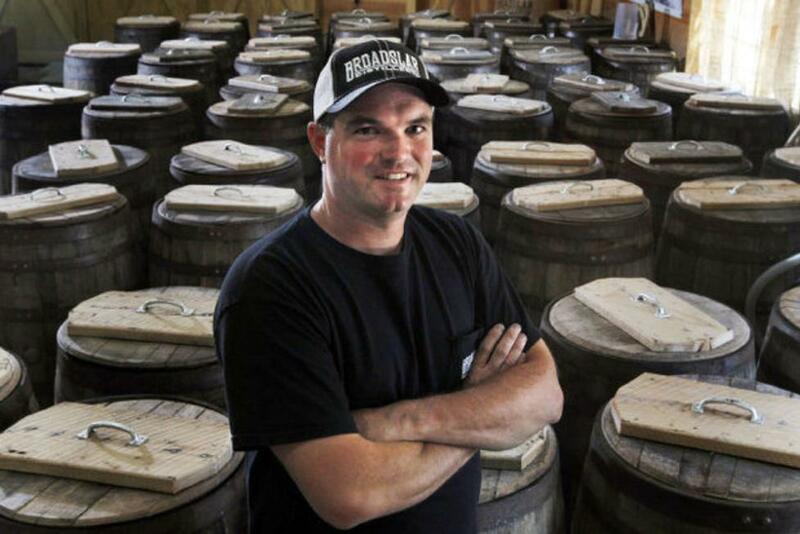 He makes a Reserve Shine - aged whiskey in oak barrels, made from NC American Oak stays from a local saw mill. He doesn&apos;t add coloring like other brands...again, the quality of the product speaks the loudest. There&apos;s Carolina Coast Rum, the first product on the shelve for Broadslab - Jeremy compares it to "Island Rum", even though he hasn&apos;t had the pleasure of tasting Island Rum. Apple Shine is his newest product and he thinks it will be a big seller because, "ladies like it a lot". It is 50% proof and has real juices, spices, and a little cane sugar for sweetness. The hand-crafted glass of Broadslab shine or rum you sip on in the tasting room doesn&apos;t just have your basic white lightning ingredients in it. Moonshine has a legacy all on its own....it has the weight of a war between the lawful and the lawless, the sense of secrecy as hands toiled to distill in the dead of night, the smell of wild southern nights, gun smoke, and pure, grain alcohol...the taste of sizzling lightning tempered by time and passion into a smooth and robust drink. Can&apos;t you just taste the heritage in every sip! UPDATE: You can now purchase up to 4 bottles of Broadslab per person, per year on-site at the distillery and tasting room in Benson, NC when you stop in for a tour. Broadslab products are located in local ABC stores in 60-70 counties in North Carolina, and in a tri-state area including South Carolina and Georgia. Some of the local restaurants and bars featuring Broadslab are Moonrunner&apos;s in Garner and Chef and the Farmer in Kinston. Although it is fine sipping shine -- we think his products fit very nicely in any of your favorite drink recipes. Moonshine Margaritas, Mulled Strawberry Mojito with sugar rim, and the one he mixed up for us...Lemonade Shine. See the picture below for the recipe. He suggests you can replace the shine with the spiced rum...some folks like it better! 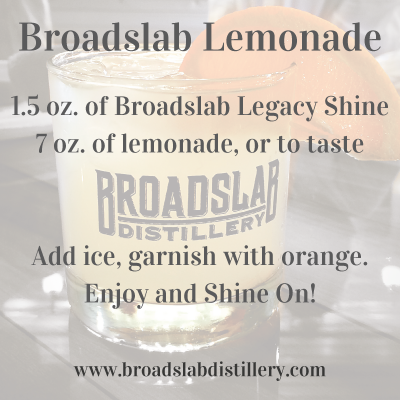 Visit Broadslab Distillery for the shine and you certainly won&apos;t be disappointed. But stick around for the stories and you&apos;ll find yourself perched on the bar stool long after the shot glass in your hand runs dry.